In small tourist place Sevid is placed this beautiful holiday house. 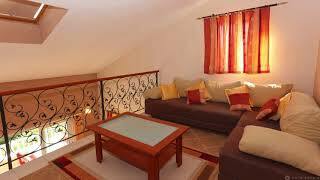 It is tastefully and functionally furnished, with all amenities for relaxing family holidays. It is located in the second row from the sea and only 50 meters from the pebble beach. Sevid is a small charming and peaceful place with the most essential shops. This cozy apartment is a very welcoming and well-decorated accommodation choice and perfect for an unforgettable stay in this charming Dalmatian village. The 130m2 apartment has been designed to accommodate up to eight people and is located on the second floor of a beautiful family house. The main entrance leads onto the spacious lounge with a comfortable corner sofa-bed, LCD television, table and chairs. This is a great area to unwind after a long day. There is also a well-equipped kitchen. There are three large and peaceful bedrooms and two bathrooms. The lounge has a delightful balcony that overlooks a beautiful cove and nice courtyard in a front of the house. There is also free WIFI internet connection available throughout the house. The wonderful location provides a fabulous starting point for your sea excursions.